We all know that unicorns belong in the realm of magical creatures, and it is nigh impossible to actually find out out there in the wild – for very obvious reasons, of course. They simply do not exist other than being in the realms of one’s imagination. Still, to tell that to your little one might just break his or her heart, which is why the $9.99 Magical Unicorn Magnet Set does melt the heart when you take a look at it. 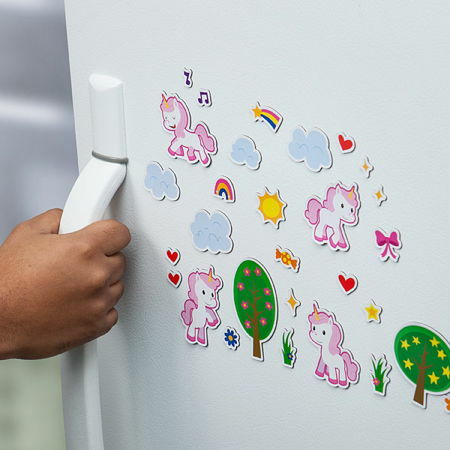 You can transform your boring fridge or file cabinet into a magical look that is full of unicorns, thanks to three sheets of magnets which will allow you to customize the magic. You won’t be able to find this anywhere else since it is a ThinkGeek creation and exclusive.